You are currently browsing the archive for the Random thoughts category. 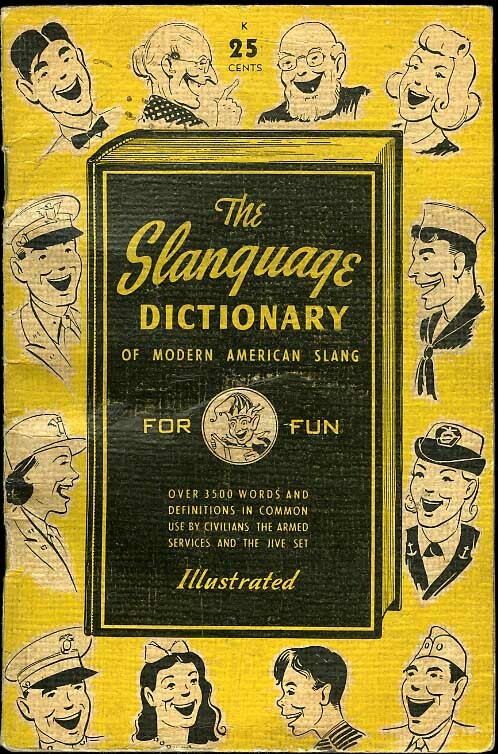 July 26, 2013 in 1950s, Random thoughts | Be the first to comment! 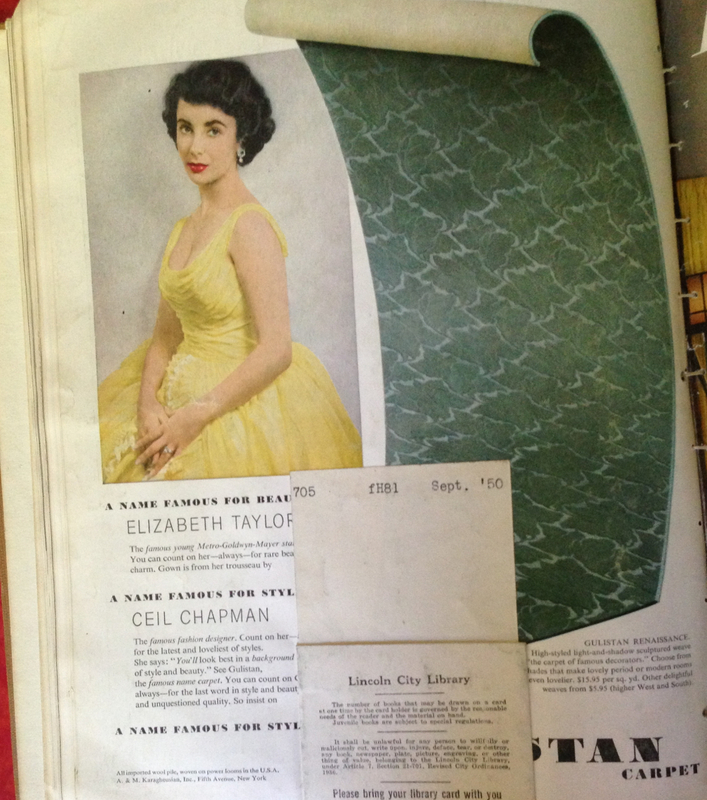 I started paging through the bound collection of 1950 House Beautiful magazines that I have lying around here and I started noticing the striking difference — and amazing sameness — of the ads that appear in the magazines then and now. I happened to have some new issues in my massive “someday-I’ll-get-the-chance-to-read-these” pile and I started to contrast what the two years’ issues reveal about us as a society. Some things never change. Cars will always be the full-page eye candy of the magazines. Although our ads today tend to emphasize more environmentally-friendly features, there are still some common threads. We still want Cadillacs to reveal that yes, we are just a tad bit more successful than the average Joe …. Today, rather than having these little ads make up the tiny little ads in the back of the magazine, we get to see full-page ads of Botox-injected, plastic-surgery laden, professionally hairstyled celebrities pretend like they actually use these products to look the way they do. Call me jaded if you will, but I’m pretty certain Courtney Cox’s hair has never been drenched with any Pantene product. Just a hunch. I made this one larger so you could see the text: “made from certified natural materials.” There’s that environmentalism again. And now? AllState Insurance graces the back cover, presumably trying to convince you that once your house is House Beautiful, you need to sign up with them to protect all that beauty. What would Mad Men be without the liquor? Today it seems that liquor ads are becoming more frowned-upon. I figure in a few years the liquor companies will suffer the same scorn as the tobacco industry and ads for booze will not exist. Two pages of ad space for this drug? Show me the money! While Americans certainly had debt in 1950, it wasn’t as easy to get into debt as whipping out a little plastic card and sliding it through a machine in the name of keeping up with the Joneses. The text for this ad is interesting: no late fees, no penalty rates, because there are plenty of other things to stress over. Yeah — how about the DEBT that people are incurring on their credit cards for crap they don’t need? That’s probably the most stressful thing of all. Now go sit in a corner, Citibank, and count your millions. Oh, and friend them on Facebook. It’s how we roll in 2013. April 17, 2013 in Random thoughts | Be the first to comment! I don’t normally do movie reviews, but I rely very heavily on reader comments on Amazon and Netflix before I watch a movie, so why not spread the word about movies I like as well? This past weekend, while trying to find a movie to enjoy after a long day of work, I stumbled upon a movie called Searching for Sugarman. I kept clicking past it, not thinking it looked like anything good. Who cares about where Sugarman is — whoever he is? But then I noticed that the movie had a nearly perfect rating out of several hundred reviews. So, I took another look. It turns out that Sugarman is the nickname of a 1970s singer-songwriter named Rodriguez. Never gaining popularity in the United States, his recording career fizzled out after a couple of years, even though his hippie-era music and lyrics fit right in with the Bob Dylan-type music that was so popular at the time. Because Rodriguez was a little late to the scene is the reason that his music never took off; after all, the US had been getting a steady dose of anti-establishment hippie music for a few years and perhaps there wasn’t room for yet another peace-loving guitar strummer. However, I think that any good singer-songwriter will find a niche eventually; it just depends on what part of the world really needs that music at that time. Turns out that Rodriguez’s music struck a chord with apartheid-riddled South Africa. The problem was that Rodriguez never knew that his music had sold half a million copies there. When his career failed to take off and his label eventually dropped him, Sixto Rodriguez faded out of the tiny spotlight he was in and settled into regular life in Michigan, eventually working in the demolition business. 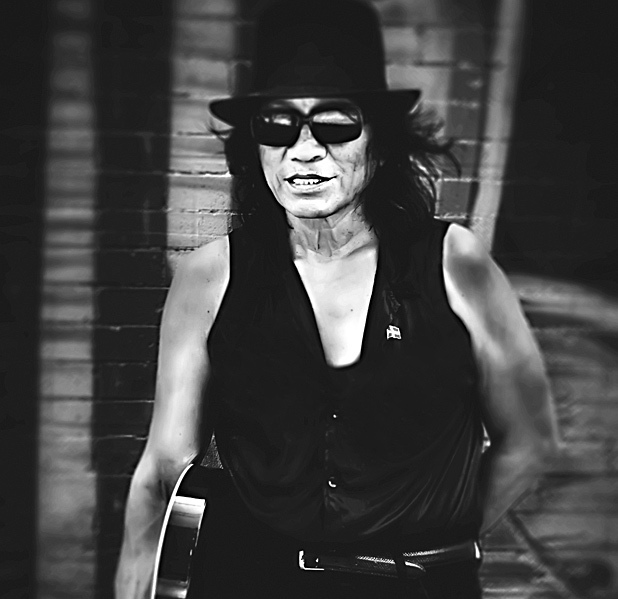 Fast forward twenty years … a journalist became curious about where Rodriguez had ended up after his brief career. Part of the reason why no one had searched fro him is because the rumor mill had a fantastic story about the night that Rodriguez supposedly killed himself — in front of an audience. For years it was passed around as true, and no one thought that the rumor may just be a bunch of crap. So, as all good “driven journalist” stories, this one didn’t give up. He kept digging until eventually his story about his search reached Rodriguez’s daughter, who promptly contacted the journalist, eventually leading to a phone call from the man himself. I couldn’t help but smile as the journalist recounted the night he received a phone call from this artist. In fact, the movie sets up the viewer to believe that the rumored on-stage suicide was really what happened to Rodriguez, and as the mystique of this man grows, so does our own curiosity. Imagine finding out that Elvis was still alive and that he decided to give you, his biggest fan, a call to say hey. That’s how it felt to this journalist, and his excitement comes across to the viewer at full blast. Finally about halfway through the documentary, we meet Rodriguez. We first see him in dark profile, then in an interview setting. Despite being out of the public eye for decades, the man has the “rocker” look down pat, but he comes across as extremely shy as he hides behind his dark glasses. The documentary takes us on a journey to South Africa as he plays his first concert in over 20 years to a packed arena. The aging songwriter, clad in black, looks every part the Johnny Cash of folk singers as he owns the stage as if he hadn’t been working a blue collar job in his “other” life. I always enjoy documentaries that tell stories I have never heard, and this movie entertained me from beginning to end. It’s always refreshing to hear the stories of humble people who do things not for fame and fortune but simply because they enjoy doing something. It’s refreshing to know that for every computer-aided Barbie or Ken doll out there who is groomed to be a face rather than a true singing talent, there’s someone like Sixto Rodriguez who cancels them out, so to speak. That’s right, Justin Bieber … I’m talkin’ to you. April 13, 2013 in Random thoughts, WNAX | Be the first to comment! I’ve written before about how it’s very easy to get up in nostalgia, forgetting the negative points of life at that time. I think there are times when our eyes are opened to this; I know some of my friends and family experienced this first-hand in the past week after they were hit with a massive ice storm in South Dakota and many were without power for a couple of days at the least. Some are still without power. Some people, like my mom, enjoyed having to hunker down in the candlelight, layer on the clothing, and cook on the woodburning stove. Others cursed as each hour of darkness went by. However, I still saw Facebook posts about how neighbors would drop by with chainsaws (to move the huge branches that had fallen from the heavy ice coating) and car chargers for phones so that even without power, people could stay in touch with friends and family. After listening to this helpful program day after day reminds me of the close neighborly spirit of long, long ago when people, especially farmers, did and could rely on their neighbors in time of need. Yes, in those days, even without telephones, somehow when help was needed, help came, voluntarily and generously. This old world certainly has changed, but the people, contrary to popular belief, have that same helpful feeling toward each other now that our parents and grandparents shared between them so long ago. Some 25 years ago I had a recipe for raisin cake that was made with one cup of bread sponge. I have lost the recipe years ago and I wonder if one of the neighbors could help me with it. I’d be so thankful. This morning as I was doing my Saturday’s mopping I was listening to the radio and happened to have it turned os that I got your program. I have heard several ladies talk about your program and what help they get from listening to you but I never had listened until this morning. I think it is very nice to be able to help one another in this way. I noticed one lady asked for a cake recipe which called for one cup of bread sponge and I happen to have a recipe which my mother used every time she baked bread years ago. I hope it’s like she wants. My sister … Mrs. Robert Huber … is a great neighbor lady fan and has had her name mentioned several times … she even won a dollar! Today, this spirit of neighborliness still exists online; one only has to peruse through blogs to see how people still take the time to trade recipes, ideas, hints, and advice. What strikes me now is the time it took “back then” to be neighborly, and sometimes I think we measure our desire to be helpfulness in how many clicks of the mouse it would take in order to be helpful. Mrs. Jacobsen, in response to Mrs. Hecht, would undoubtedly have to hand-write the recipe, place a stamp, and mail the letter. She did it for one reason: she had a recipe that someone else wanted. She received no monetary gain — just the notoriety that came with being published in the Neighbor Lady cookbook. The ice storm in South Dakota — while incredibly destructive — has brought back that neighborly spirit in many cases. I saw several posts about how meals were brought over, or home opened to friends, or yards cleaned up. Starbucks tried to do their part by handing out free coffee to police and firefighters — which, although generous, left out two other obvious categories: paramedics and power linemen. But what impressed me most of all were the random acts of kindness that no one had to do — they just simply did them because people knew that they were all in the same boat (or, in this case, all on the same ice-skating rink!). It’s easy to claim that neighborliness has died simply because we get so comfortable in our everyday lives that we don’t take the time to do things that don’t directly benefit us. The spirit is there, just as it was in 1942. Whether it’s passing along recipes for raising cake or wielding a chain saw to clear out fallen branches, the desire to help others is alive and well; unfortunately, it takes a tragic event for that spirit to emerge. February 23, 2012 in Random thoughts, Uncategorized | Be the first to comment! February 22, 2012 in Random thoughts | Be the first to comment! A couple years ago I wrote about Campbell’s soup ideas that sounded ridiculous and fairly disgusting. Today I ran across an article that made me giggle; obviously Campbell’s is not the only company out there who made similar errors in product creation. Read on: 13 Retro Products That Failed To Catch On (PICTURES). And now, on with the show . . .
September 11, 2010 in Random thoughts | Be the first to comment! I almost didn’t write a post for 9/11, but it just felt wrong to let this day go by without something. I would hate the date to become another ho-hum factoid that everyone takes for granted. As the tributes often proclaim, we must always remember. And here’s why. On September 11, 2001, I was in my third year of teaching at a small Midwestern school, and I was also 8 months pregnant. The school year was new, spirits were high, and I was excited to meet my son in a few short weeks. Imagine my shock when the high school principal rushed in my room, looking panicked, asking if I had the TV in my room. (The school I was in then didn’t have a lot for technology; internet was slow, and the rooms did not have cable TV in each room. Each floor had a TV on a rolling stand to use for showing movies, etc.) I said no, then asked what was going on. He held up two fingers and blurted out, “Two planes just hit the World Trade Center.” Then he disappeared around the corner, on the hunt for the TV. Unfortunately, he had made this proclamation in front of my class, so I didn’t have a chance to process this information before the comments starting erupting. “Explosions are always cool!” he replied. “Not when people die,” I replied, my mind scrambling in how to make this a teachable moment while also yearning for some extra information. I decided to go down to the office and figure out what was really going on. Needless to say, the mood was somber. The other teachers in the office nodded as questions were fired at the school secretary. Did anyone have TV? Could anyone get internet? What was going on? Was it terrorism? Should we just go on teaching? That last question seems silly, because it was, after all, my job, but the heaviness of a nation changed was hanging in the air, and it didn’t seem right to just go on. Returning to my classroom, I flipped on the radio, which was crackling with updates every minute. Turning to my computer, I tried in vain to get internet reports or pictures of what was going on. If my students could see what happened, I thought, they would no longer think it was cool. The mood changed quickly as the enormity of the situation started clicking in my students’ brains. Estimates of ten thousand casualties floated out of the radio. Ten thousand! Eyewitness accounts of seeing the planes hit the building, with the subsequent explosions, turned the light of amusement in the kids’ eyes to one of uncertainty, and even horror. Then one of the towers collapsed, and the mood blackened even more as the radio reports fretted about the number of people left inside when the building collapsed. Reports of jumpers caused the kids to look at each other, their eyes betraying the cool facade they tried to present. I began to suspect that many of my students didn’t understand what the WTC even was — what it looked like. After all, Manhattan was far enough away from Iowa that it might as well have been in a different hemisphere. All of that was “over there.” Most small-town Iowa activities did not concern the WTC, so why bother? “Why can’t they just get everyone out of there?” one girl asked. Her question was answered by the reporters, who talked of elevators that didn’t work and people trying to flee down hundreds of flights of stairs. Deep inside, I think we all were wondering: would we be able to make it out? Then the second tower fell; the decimation seemed never-ending. I don’t remember much about the latter part of the day, mostly because as the news reports continued, and the story of Flight 93 came out, I knew that my country had been indelibly changed forever. I disliked the feeling of doom that permeated our little school, and the chaos-spreading rumors that caused normal adults to act like panic-stricken teenagers. Our principal gave everyone permission to go uptown and get gas, as he had heard that a gas shortage was imminent as a result of a pending war with countries that supplied our gas. Going home, I noticed that the lines wrapped around the block for the handful of gas stations in town. I thought about the baby growing in my tummy, and what the future held in store for him. I tried in vain to dampen the ever-growing panic in my gut. That experience remains the most poignant of those days after 9/11, because it was the most obvious evidence that our nation had something horrible happen to it, and for once we were paying attention. For a few days, we didn’t give a crap what Britney Spears was up to. For awhile, we were truly united. Look back, remember, and keep the American dream alive. It’s there. It always has been. Let’s make sure it always will be. When I made the decision to create a retro kitchen (for now . . . the rest of the house may follow), I struggled with the knowledge that while I loved the retro look, a potential home buyer may not. We’ve been in our house for ten years, but that certainly didn’t mean that if the perfect house came up for sale on an acreage somewhere near us that I wouldn’t drop everything to go buy it. 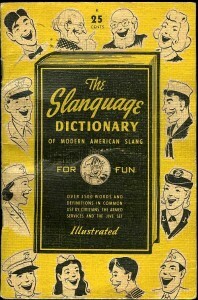 I absolutely love this slang dictionary from the ’40s that is posted over at Square America. While you’re at it, if you haven’t yet discovered this awesome site, take a look through all the great photos. It’s like your family’s photo album, but way better. It’s the end of the quarter at school, which not only means that I get to spend my weekend correcting mountains of papers, but I’ve also lost most of my ability to form paragraphs longer than a sentence or two — which yes, I know, isn’t really a paragraph. My brain is tired, but I have had some interesting things happens lately. The result? Snippet-writing time.